It has been six months since I purchase an Android phone. My original plan is to study and create an application for this. Unfortunately, I haven't got far enough to learn this.. I just couldn't find time. So all I can do for now is to enjoy this and play with some of the most useful apps out in the market. As the name suggests, it is an pokémon application created by a pokéfan for the pokéfan. 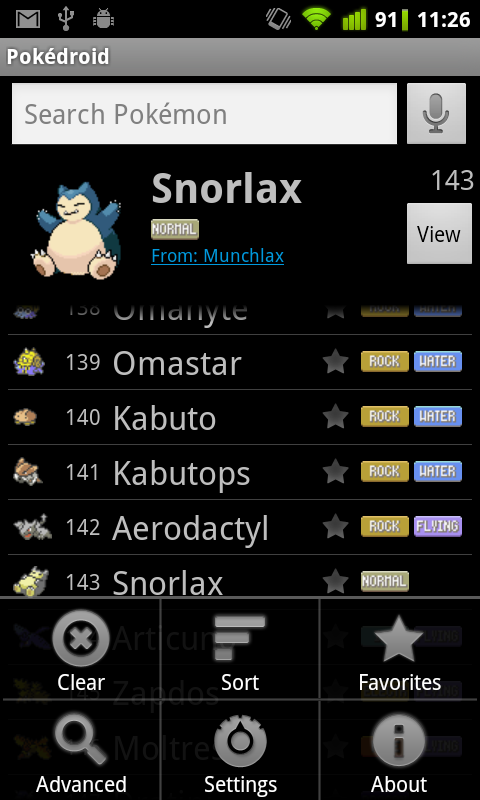 It is actually a version of Pokédex created for Android. It has all the basic info that you might be needing when playing the game and ranges from the 1st gen to the latest version of pokemon. The nicest thing about this is it talks like the normal Pokédex. Bad thing is The Pokemon Company (TPC) is now removing all pokémon related apps in the droid market, and that includes this application. This was created by Nolan Lawson. I find this browser more useful than the default one. It has almost all the functions a normal opera browser has. Pretty neat! Other than that, the emulator seems ok for me. All you need to do is find over the net the GBA BIOS and you're off to go and enjoy! So far that is all of my favorite apps, though I have more applications installed, this four are the most used. Ayoko din magroot, natatakot pa ko eh. Though rooting your phone is advisable only if you are knowledgeable enough to try it.